Spacious is an incredibly spacious multipurpose responsive theme coded & designed with a lot of care and love. This is the Spacious theme instruction page. We have tried our best to keep it as simple as possible. If you think it can be made even simpler let us know we will be glad to change it. Let’s start! On the left side you can see the table of contents of this documentation. Jump to the section you want, or read it all through – your choice. Let’s move on! You can find the field to write the Site title and tagline for your site below logo. You can also find the option to hide the tagline there. 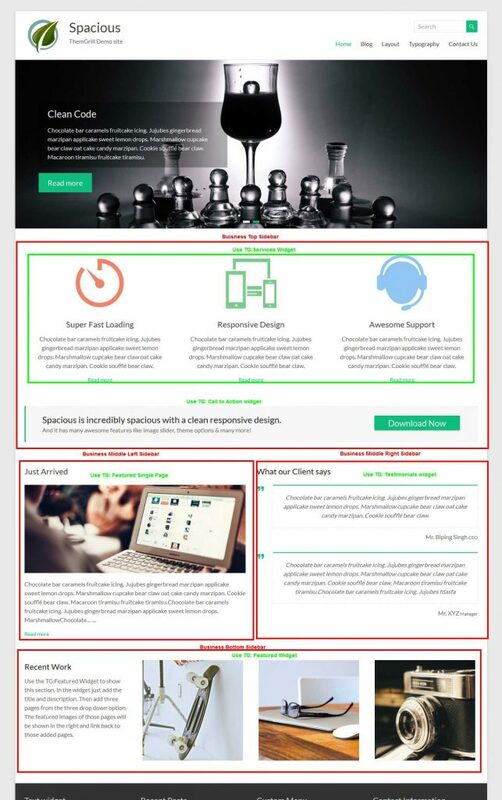 This theme supports header media provided by the wordpress. Now, you can upload image and video as the header media section on the Custmizer. Upload your video in mp4 format or enter youtube video URL. Upload your header image. Note:In mobile devices video will be replaced by header image. Click Save and reload your page. The Business template has four widget areas within it. Have a look here in this image. Click on the image for a better view. You just need to add some widgets to these sidebars to setup the business template. Add this widget to Business Top/Bottom Sidebar. In this widget, select any of your pages in the drop down option. There are six page drop-down options within it. The title, description and featured image of that same pages that you select will be shown. Add this widget to Business Top/Bottom Sidebar. In this widget, add the first and second title line, button text, button redirect link and all is done. Add this widget to any Business Sidebar. In this widgets, add the title, text, name, byline and all is done. Add this widget to Business Middle Left/Right Sidebar. In this widget, select any of your page in the drop down option. The title, description and featured image of that same page that you select will be shown. Add this widget to Business Top/Bottom Sidebar. In this widget, add the title and description. select any of your page in the drop down option. There are three page drop-down options within it. The featured image of that same page that you select will be shown. Add this widget to Business Top/Bottom Sidebar. 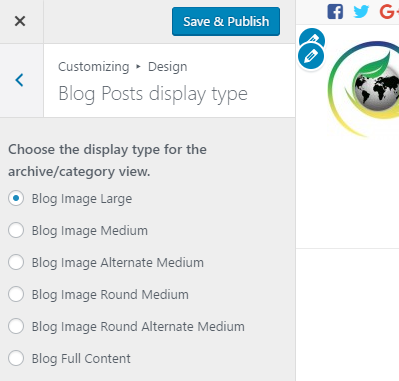 With the help of this widget, you can show some of your posts, news or articles in your site. Add this widget to any sidebar to show some fact about your work, business or site. This will display the icon, animated number and text. Add this widget to Business Top/Bottom Sidebar. It displayes the logo or image. You can use it to show the client that you worked with. You can show the price and planning of your service or product. You can add your plans, price and button that will take to the related page of that pricing plan. This widget will help you to display team members from your company, office or organisation. This widget has the option to show member photo, name, title and social links. Its will be the great way to introduce your team member with this widget. All the options related to Header part are available in Appearance-> Customize-> Header. After uploading logo from Site Identity section, check Show logo only or Show text only or Show both or Disable to show/hides the logo in header. There are two options to show your header in the pro version of the theme. Just select your choice and save. Type 1 (Default): Social icons & small text area on left, menu area on right. Type 2: Social icons & small text area on right, menu area on left. 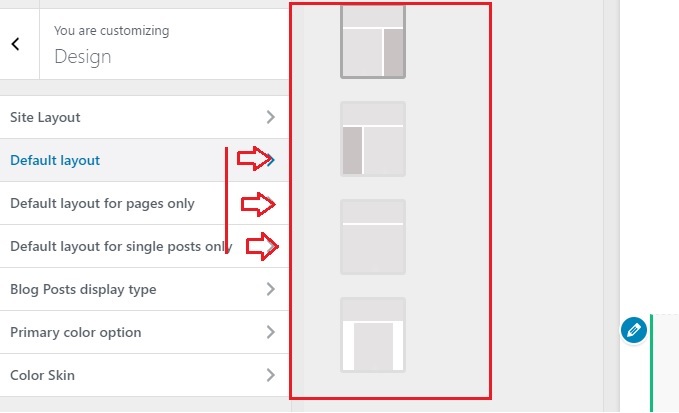 You have to active top header bar first to display social icons or menus in the top header of your site. Go to Appearance > Customize > Header. On the Active header top bar section, Click on checkbox to activate top header. After activating Header Top Bar, you can customize it’s content and display type from other section: Header Top Bar Display Type, Header Info Text. On the Header Top Bar Display Type section, select an option. On the Header Info Text section, add content to the editor area. This text will appear on Header Top Bar if you’ve activated it from Activate Header Top Bar section. Position Above (Default): Display the Header image just above the site title and main menu part. Position Below: Display the Header image just below the site title and main menu part. Option to make header image link back to home page or other URL. This option allows you to add custom text before breadcrumbs that appear on header section of the posts/pages/archive etc. Note: We support two plugins: Breadcrumb NavXT and Yoast SEO Breadcrumb for showing breadcrumb in post, page, archive etc. Yoast SEO breadcrumb is visible, if you’ve activated the plugin and enable Yoast breadcrumb. If you’ve activated Breadcrumb NavXT, it will override Yoast SEO breadcrumb. This option enables the new menu style in mobile devices with sub menu toggle icon. numberous fields for social icons. If yours own is not there then you can put additional too. How to add social links? Activate the Social link area from the checkbox on first option. description and redirect link. You can link to a link within your site or outside of your site. To set the different design and options follow the follwing instructions. You can choose the Wide and Boxed layout with different content width from this option. following option for layout there. You can choose the Dark (Black) and Bright (White) Skin option from this option. You can choose any color as your primary color from this option. You can choose default display type, display type for pages, post and bolg page from here. Note: Only few option available for Free. Activate term description from the checkbox. It will show the category/term description to the category page. Go to dashboard, then create a page. Give it a name “Contact” or “Contact us” as your wish. 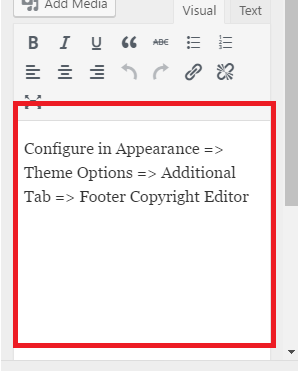 In pro versio of the theme you can manage the footer column, edit copyright and allign the copyright section. You will find the box as shown below in Footer Copyright Editor section where you can edit the footer copyright text.